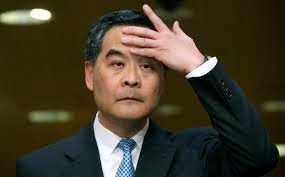 Bluegrass Pundit: Hong Kong’s chief executive tells former colony's citizens to act more "like sheep". Hong Kong’s chief executive tells former colony's citizens to act more "like sheep". Hong Kong’s unpopular chief executive has infuriated pro-democracy campaigners by using a Chinese New Year message to urge the former colony's citizens to act more "like sheep". In a brief video address commemorating the start of Year of the Sheep, CY Leung said sheep-like behavior was required in the wake of the turbulence caused by last year’s street protests.